Ten years ago, like any startup, we headed to a tradeshow with a banner and a prototype looking to gauge interest in this new thing – LED lighting. But unlike many startups, we were a little bit different. You see, we had been working with LEDs since 1995. You might say our startup had a head start. Evluma founders John Renn and Will Reed met at CX Systems in 1976. CX Systems, later purchased by industry giant Gretag, specialized in early commercial photographic processing equipment. In 1995 John and Will implemented LEDs in a groundbreaking, automated device that scanned film, detected frames, and facilitated processing. They’d continue to work together, form their own company, create the first index print for Kodak, the Kodak picture CD and then release an award-winning printer that used over 2300 red, green and blue LEDs in a light engine with proprietary cooling technology. Today our flagship AreaMax luminaire carries over 40 patents and we continue to develop groundbreaking technology every day. I’ve had the pleasure of seeing Evluma grow over the last 10 years. I’ve experienced just about every part of this business. I’ve held a soldering iron, a tape gun, tracked down parts for R&D, built websites and best of all met many of our customers and suppliers at tradeshows and events. I’ve seen good people move on to new adventures and thrilled to see good people join the team and stay. What I’ve witnessed is that Evluma is hands-on, real people, committed and always looking to improve. 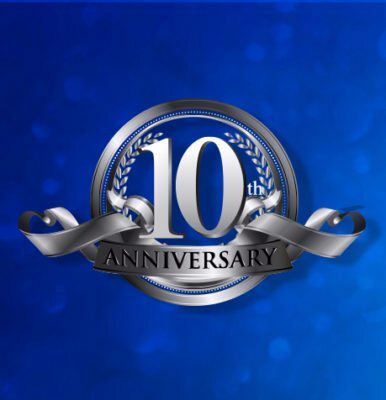 Words cannot express how grateful we are to our customers for these last 10 years. Because of you our team has stayed together, transformed, innovated and solved problems, some of ours and we hope some of yours! In 2008 we could only theorize that lighting would become a connected technology, but that didn’t faze us either because automation and networked systems were also part of our past. Those on-staff experts have made the transformational journey to LED lighting with the rest of us, creating Photocontrol Failsafe and ConnectLED. Sensing a theme here? I hope so because that theme, experience and preparedness, is what got us here today and what will keep us ahead tomorrow.